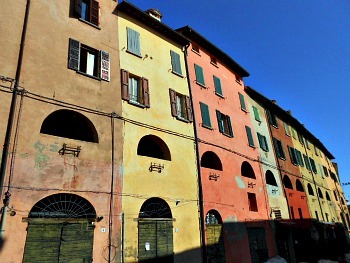 Brisighella: A Town Built on Three Chalk Outcrops Near the 'Vena del Gesso'. 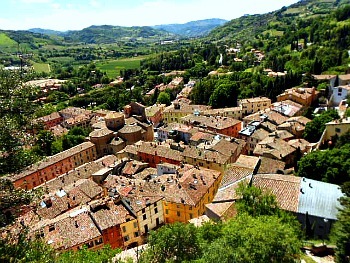 The charming town of Brisighella is perhaps the most interesting built location to visit within the "Vena del Gesso" ('Chalk Vein') Regional Park. The town itself is laid at the foot of three characteristic chalk peaks, which host the Rocca (castle), the Civic tower and the Santuario di Monticino respectively. These three features are among Brisighella's highlights and will be described in more detail later, one by one. But before doing that, let us give a look at the location at large (an aerial view of the town – as captured from the tower hill – is shown above; below, a similar sight is offered, but in a winter outlook). Situated at the foothills of the Northern Apennines, the territory of Brisighella displays quite varied features. The hills are mostly clayey, and it is from these soft clays that the chalk spurs stand out with their distinctive outline. The climate is tempered by the Mediterranean influences buffeting the Adriatic coast; it is therefore suitable for olive trees (there is a small I.G.P. 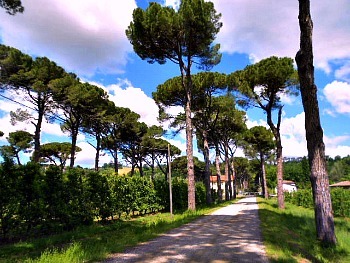 – Italian acronym for Produce of Geographic Certified Origin – olive oil production here, the 'Olio Brisighello') and for different types of maritime pines to grow, which add here and there a 'classical' touch to the landscape (see for instance the picture below). 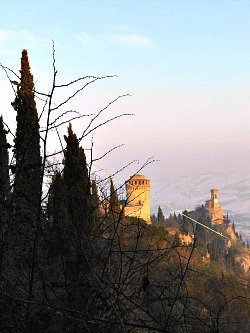 The origins of the town date back to the end of the 12th century, when Maghinardo Pagani built the first important castle of the Lamone valley on one of the three peaks of selenite – a gypsum rock. In the 14th century the Manfredi – Lords of Faenza – started to build a bigger castle on another peak; 200 years later the Venetians conquered it and gave the castle its present look. The old town centre is still made up of crooked lanes and old streets, ancient remains of the defensive walls and stairways carved into the gypsum rock. One can therefore say that the history of Brisighella is strictly interwoven with that of chalk. The ancient Via del Borgo – a covered street dating to the 14th century, with arched open windows of different sizes – was originally traced on a defensive bulwark of the medieval citadel at the back (see the picture below). This street is now quite famous for the very nature of its extraordinary architecture, and is also called “Via degli Asini” ('Donkeys' Alley') for the cover it supplied to the many carts and donkeys which used it in the past. Brisighella boasts many sacred buildings too, the most important of which is the Pieve di San Giovanni in Ottavo, (or 'Pieve del Tho' in the local dialect), a few kilometres to the south of town: this church – built in the 5th century and rebuilt around the 11th/12th century – is so called precisely because it is located on the 8th mile of the ancient Roman road connecting Faenza and Florence. The first documented mention of this church goes back to 909. Built in Romanesque style – with small lateral arches and a plain rose window on the facade – the building has a three aisles structure with two rows of columns and a truss ceiling. Amongst the artwork displayed here, there is a sandstone bas-relief of Lombard origin from the 8th/9th century and a Crucifix in walnut dating from 1250 (see an image of the church exterior below). 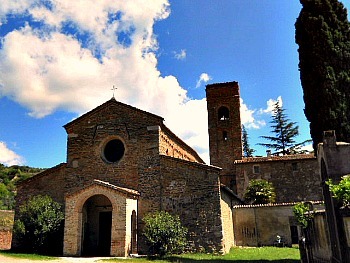 In the centre of town, the Collegiate Church of San Michele was built in the second half of the 17th century and opened in 1700. Once the facade had two lateral bell towers, which were damaged by the earthquake of 1781, demolished and never rebuilt. Inside the church many masterworks find their proper location; most importantly, a wooden Crucifix dated 1500 and the “Adorazione dei Magi” (the 'Adoration of the Three Kings'), a large altarpiece by Marco Palmezzano (1514), coming from the church of Rontana. 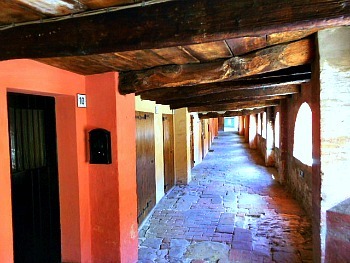 This is a unique walkway, perched high above the actual street level: on one side it has the tiny entrances to various ancient homes (still lived in today), while opposite – on the street side – it displays a long line of arched openings which overlook the square beneath and give light. Built approximately around the 14th century, it was traced above the oldest defensive bulwark of the settlement. At the beginning it was open and served as an outpost for the guards, but later it lost its military use, was covered and became home to many families who built their dwelling here. The alley was mainly inhabited by the carters who used the walkway to transport gypsum from the Monticino caves (read below) with their donkeys (hence the name of the street) – so that the history of this atmospheric alleyway and that of chalk extraction in the area literally go hand in hand. The stables were in front of the arches; while people lived upstairs, the carts were kept below – at the lower street level – in large cart-houses dug 'live' into the chalky rock, which now host shops and restaurants (below, see an image of the “Via degli Asini”; a view from the street level is shown two pictures above). 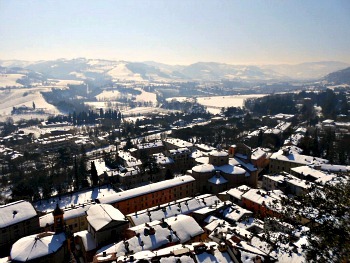 The Rocca (castle), the Clock (or Civic) Tower and the Monticino church hill are the three distinguishing features which make Brisighella so well known, and provide its unique skyline (see the picture below, taken from the Monticino hill, with the castle in the foreground and the clock tower in the background). 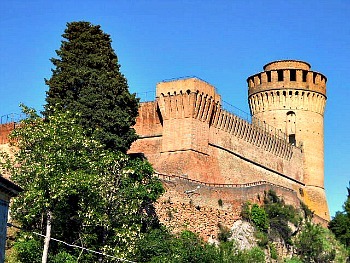 Built in 1310 by the Manfredi family (Lords of Faenza), the castle was under their dominion until circa 1500, when the 'condottiere' Cesare Borgia, son of the Pope Alessandro 6th – also known as the Valentino – ruled over it, but for three years only. From 1503 to 1509 the Rocca was in the hands of the Republic of Venice, who added the Great Tower and more defensive walls. Eventually, the castle ended up – as indeed most of the rest of Romagna – under the control of the Church State. The castle has still the usual characteristics of a medieval fortress: chain holes for the drawbridge over the main entrance; shelves and slots; guards' passageways on the walls. From 1977 until recently, it was home to the "Museo del Lavoro Contadino" (Peasants' Work Museum), which has now been dismantled; it contained a vast array of rural land-working implements and many other items related to country life, which are currently in deposit and awaiting for a new destination where to be exhibited (a picture of the castle is shown below). When visiting Brisighella, you do not have to walk up and down each individual peak (unless you want to). The most logical route, in that case, would be to climb to the tower first, as in fact, the tower and the castle are connected by an untarred country lane that runs more or less level, and which commands interesting views on both buildings (see image below). 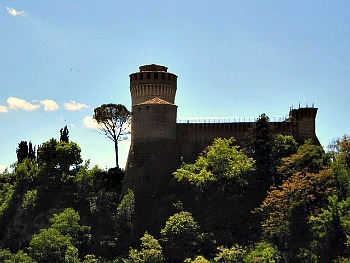 The tower was originally built by Maghinardo Pagani – with square blocks of chalk rock – to control the siege of nearby Baccagnano castle, and until the 16th century it was part of the defensive structure of Brisighella. Damaged many times, the tower was totally rebuilt in 1850, when the clock – working on a six-hours system – was also added. The building is currently closed due to restoration works, but the panoramic location still makes the steep climb up to here well worth the effort. 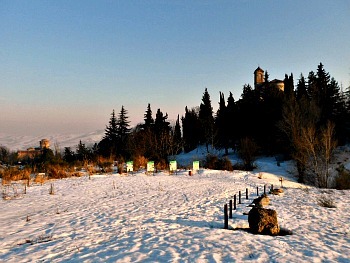 The hill over which rises the Santuario di Monticino is at a short walking distance from the castle. In this location people worship a polychrome terracotta plaque made by an unknown artist, dated 1626: first placed in a small tabernacle close to Porta Bonfante (in the centre of Brisighella), the holy image was moved in 1662 to a chapel over the hill (then called Monte Cozzolo or Calvario – possibly due to its steep sides), where the sanctuary is still located today. The present building was erected in 1758, and went through several changes ever since; in 1926 the facade was rebuilt, while the frescoes inside date to 1854. 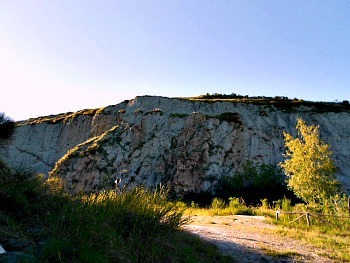 At the back of the sanctuary there is a cave from which chalk was mined; the location – still known as 'Cava di Monticino' (Monticino quarry) – has now been turned into an open-air geological museum (an image is displayed below). From this location, an interesting sight opens up over Brisighella. This is also a karstic area; the Acqua Fredda stream – that goes underground right here – then resurfaces just at the entrance of town, and as such it has always been used as a source of drinkable water. 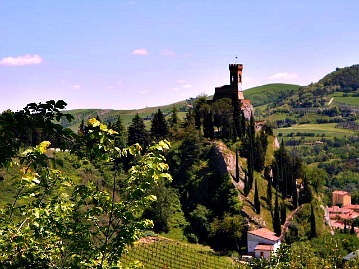 The geographic setting of Brisighella also becomes clearer from this ancient quarry site, as the two more central peaks at the foot of which the town centre is built (with the castle and the civic tower) and the spur with the Monticino sanctuary – in the foreground – stand out clearly in the middle of the valley (as in the picture shown below). As anticipated before, near the ex-quarry (portrayed in the image below) is now located an interesting Geologic open-air museum, which is one of the highlights of the "Vena del Gesso" Regional Park. This circumstance has made it possible to turn the area into a real open-air book on geology, which allows to study directly – 'live', as it were, and with the help of very useful panels – the complex history and all the variations connected with the deposition of chalk, as well as the human and natural setting of the area at large. Brisighella's territory, lying between the Northern Apennines, the plains of Romagna and stretching up to the Tuscan border, hosts peculiar environments and landscapes with unique geological and naturalistic features. 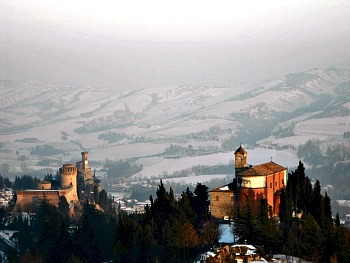 From the plains around Faenza the road gently climbs towards the hills, along bleak ravines (known as 'calanchi') glistening in the summer sun (see the picture below), and eventually it reaches the town of Brisighella, with its three towering rocky spurs. Along the countless paths, walks and ancient cart routes, nature lovers and visitors can observe many different flowers, trees and animals – all peculiar to this unique land. Hereafter are described three of the main geologic features of the area, followed by a brief presentation on the local flora and fauna. It is the most spectacular feature of this territory, standing out against the sky like a real mountain chain despite its relatively low altitude. The vein of gypsum – or chalk vein ("Vena del Gesso") – is one of the most remarkable sights, from a geographical and geological point of view, of the Romagna Apennines. This formation of the terrain is called "Gypsum-sulphurous" ('Formazione Gessoso-solfifera' in Italian; Messinian era, radiometric dating 6.5–5.5 millions years ago); it runs across the whole spine of the Apennines, all the way from Piedmont to Sicily, but only here it surfaces with such evidence. Geology. The outcrop of the chalk vein stretches from the Sillaro valley to the Lamone valley – along the eastern side of the Northern Apennines – with a direction WNW-ENE; it is 1,5 km wide, and about 170 m thick. Due to the high solubility of this kind of rock, the area presents several karstic phenomena, both at surface and subterranean level: dolines, sink-holes and caves, often of remarkable size. The chalk vein is mostly composed of the same ore ('calcium sulfate dihydrate'), and has a crystalline structure with a peculiar sparkling – hence the popular name of 'selenite' (or 'moon rock'). How did it form? The Gypsum-sulphurous formation can be compared to a wide fossil salt-mine which was deposited following the closure of the Gibraltar strait and the draining of the Mediterranean Sea during the Messinian era. The lack of water and the dry climate favoured the evaporation and the deposit of gypsum – a salt dissolved into the water; the oscillations between influxes and defluxes of water caused the typical layered structure with alternated sediments of chalk and marl. This process involved the entire Mediterranean area and took place for about 15 or 16 times; each layer of the gypsum vein represents therefore a sedimentary cycle. 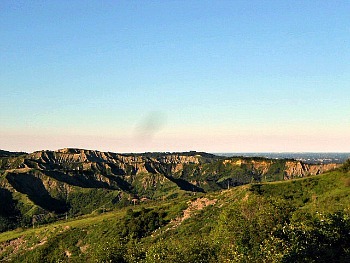 The low hilly terrain of western Romagna – set in a continuous strip from the Sillaro valley to the Ronco valley – is marked by a peculiar barren landscape, streaked with narrow small valleys and sharp rocky ridges: these are known as the "calanchi", a geological phenomenon due to the clayey terrain and to the atmospheric agents (most of all the 'washing' action of water). These formations belong to the so-called Blue Clays ('Argille Azzurre') period, which can be dated between the Pliocene and the Pleistocene era (5.3 to 1 million years ago); they present a tickness of 1-2 km, and are a very remarkable feature in the landscape around Brisighella. From a geologic point of view, these terrains are mostly made up of sedimentary impermeable soils formed by microscopic particles like dust, and caused by the erosion of rocks. Due to their peculiar structure, these particles slowly soak up a large amount of water and change their physical status, forming a mass of mud and causing the typical messy outflows which are often the trigger for landslides in the area. On the contrary, during summertime the water evaporates and the muddy clay shrinks, creating deep cracks and fissures on the ground. But how did they form? After the closure of the strait of Gibraltar and the creation of a great salted sea, at the beginning of the Pliocene era the strait opened up again, and salty water from the Atlantic filled up once more the Mediterranean basin; the Po valley – now covered by the sea – became a large gulf bounded to the north by the Alps and to the south-west by the Apennines. The "calanchi" are the remains of the old muddy seabed that until one million of years ago covered the so-called 'Padan Gulf': these are therefore sedimentary soft rocks formed by the blue-gray clays in a medium deep sea. The existence of an old sea is proved also by the many fossil remains; part of them (especially shellfishes) can still be seen with a naked eye. This rocky outcrop can be seen surfacing in the Marzeno valley, where it forms a long and narrow – but not continuous – strip right down to Cesena. Geology. In the Marzeno valley the 'Spungone' outcrop forms two main hills: the Ceparano Hill (or Tower Mountain, 510 m, with the ruins of an old tower) and the Pietramora Hill (or Castellaccio della Pietra, 509 m). This yellowish ridge stands out amongst the surrouding clayey hills, due to its structure more resistant to erosion. The term 'Spungone' comes from the local dialect word 'spugnò' (spongy); this rock actually presents a lot of holes and pores, and sometimes it does not look very different from travertine. The riddled surface depends on the selective erosive action of water and wind on rocks of different hardness. This rock (called 'calcarenite organogena' in Italian) is a calcareous sandstone mostly formed by small organic remains of sea creatures (mollusks, snails and shellfish) and seaweed. How did it form? The large amount of fossil remains – gathered as to form a reef or layers of shell sand – suggests the presence in this area of a shallow sea or a reef. The geological age of the 'Spungone' has been recently dated back – with innovative technologies – to the Piacenziana era (low-medium Pliocene), while studying the typical growth of carbon platforms between 3.3 and 3.05 millions years ago. Compared to the normal conditions of local Pliocene sediments, connected with the presence of quite a deep sea, the genesis of this rocky outcrop shows a sort of anomaly; it seems to refer to a rather shallow sea, due to the rising of the seabed. For the middle Pliocene we can therefore depict a scenery – for the area south-east of Faenza – of a marine environment with a raised seabed on the north side, displaying a reef rich in mollusks, somehow resembling today's Sub-tropical habitats. The traveller or nature lover who – mainly in springtime – finds him or herself walking through the fields and woods of this area should look carefully to every single tree, flower, animal, bird or insect: they all live here because they find the ideal conditions (in terms of climate, environment, food) to support their life. This land enjoys the benefits of a warm and dry micro-climate, with a Sub-Mediterranean influence that enhances the growth of a type of vegetation which includes typically southern plants like Pink Cistus (Cistus incanus). This is also true for many species of insects: they actually find in the south-facing side of the chalk outcrop – warm and dry – their perfect habitat. Between the warm and dry southern side and the shadowy and wet north-facing side of the "Vena del Gesso" there is a great variety of intermediate environments, with their own distinctive flora and fauna. The naturalistic haven of Pietramora, although small, presents a very diversified landscape: besides the rocky outcrop of 'Spungone' – the most relevant feature for this area – here can still be seen oak woods, pastures, shrubs, crops, vineyards; similarly, the bird populations are quite diversified too, with many species deserving of mention like Peregrine Hawk (Falco peregrinus), Common Kestrel (Falco tinnunculus; 'gheppio' in Italian), Eurasian Jackdaw (Corvus monedula; known as 'taccola' in Italian), Buzzard (Buteo buteo), Red- (Melanerpes rubricapillus) and Green- (Picus viridis) woodpecker, Tawny Owl (Strix aluco).